The best concerts in Paphos. Shows, gigs, events, classical, jazz, rock, latin, opera, ballet, film, symphony orchestras, pop, blues and folk music and all sorts of culture in Paphos. 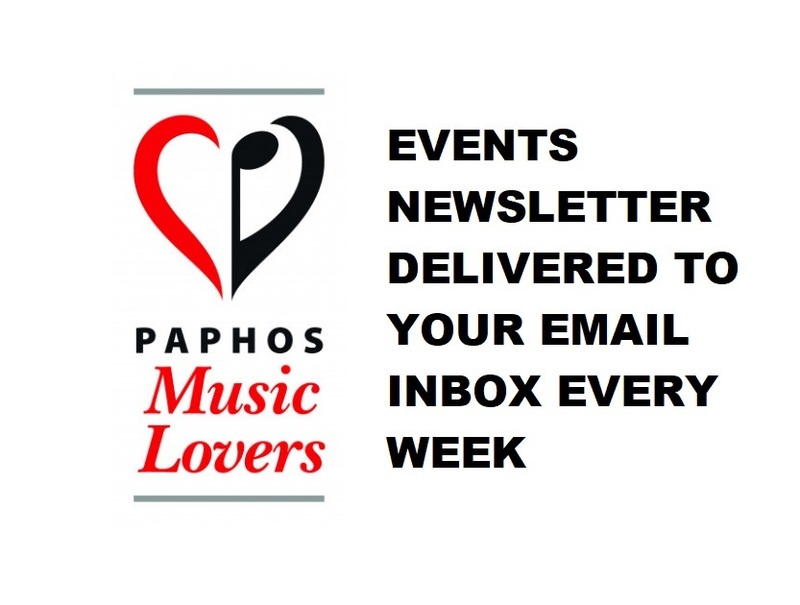 Paphos Music Lovers provides a free information service connecting the concert audience, musicians, promoters, arts administrators, venues, media and all music lovers, in order to develop audiences in Paphos. DOLLY PARTON AND KENNY ROGERS tribute by Duo Joker, Tuesday 23 April 9pm, Wild Horse Pub Aliathon Village Paphos. Free entrance. Reservations: Tel: 26847374 Andy. MAMMA MIA Movie tribute by Duo Joker, Thursday 25 April 9pm, Wild Horse Pub Aliathon Village Paphos. Free entrance. Reservations: Tel: 26847374 Andy. MUSIC CABARET by Duo Joker, Friday 26 April 9.30pm, Wild Horse Pub Aliathon Village Paphos. Free entrance. Reservations: Tel: 26847374 Andy. SCHUBERT UNFINISHED & MOZART REQUIEM, Yiannis Hadjiloizou (conductor), Cyprus Philharmonic Orchestra, Orphean Singers Cyprus, Christiana Aloneftis (soprano), Anastasia Maximova (mezzo-soprano), Marwan Shamiyeh (tenor), Yiorgo Ioannou (baritone), Sunday 28 April 8pm, Markideion Municipal Theatre Paphos. Tickets: €20. Ticket Hotline and Info: Tel: 99786577. Information: wwwpaphosmusiclovers.com. MID LIFE CRISIS, Easter Monday 29 April 2pm, Searays Café Bar Peyia. Free Entrance. Reservations: Tel: 99617415. Information: wwwpaphosmusiclovers.com. SOPRANO, OBOE & PIANO CONCERT, Tina Chester (soprano), Klaus Storm (oboe), Natalia Lezedova (piano), Monday 29 April 7.30pm , Music Studio Aspa Vassiliou Paphos. Tickets: €12. Box Office: Tel: 99279144. Online Tickets and Information: www.paphosmusiclovers.com. DOLLY PARTON AND KENNY ROGERS tribute by Duo Joker, Tuesday 30 April 9pm, Wild Horse Pub Aliathon Village Paphos. Free entrance. Reservations: Tel: 26847374 Andy. PAPHOS FOLK CLUB, Thursday 2 May 8pm, Phoenix Social Club Paphos. Entrance: Free to members, €2 for non-members. Information: Tel: 26273076 / 99908241. wwwpaphosmusiclovers.com. SOIREE EDITH PIAF, Vanessa Megalemou (voice), Andreas Michalopoulos (piano) & The Ergo Sum Vocal Ensemble, Thursday 2 May 7.30pm, La Scala De Paphos. Tickets: €12. Box Office: Tel: 99136289. Online Tickets and Information: www.paphosmusiclovers.com. POLIS CHARALAMBOUS, Friday 3 May 7pm, Phoenix Social Club Paphos. Entrance: €10 / €12 (non-members) including food, reduced price for show only. Reservations Essential: Tel: 96219797. Information: wwwpaphosmusiclovers.com. RAPHAEL PRINCE OF SOUL, Friday 3 May 7.30pm, Paliomonastiro Pegeia Paphos. Tickets: €22 including a hot and cold buffet with a free carafe of wine. Box Office: Tel: 26623444 / 97728823, Dorothy Tel: 99380182. Information: www.paphosmusiclovers.com. Stage One Theatre presents WHEN WE ARE MARRIED By J B Priestley, directed by Peter Sandwith, Tuesday 7 May to Saturday 11 May 7.30pm, Stage One Theatre Emba Paphos. Tickets: €12. Box Office: Email: boxoffice@stageonetheatre.com. Tel: 99967737. Information: wwwpaphosmusiclovers.com. ANITA TOMASEVICH PIANO RECITAL, Wednesday 8 May 8pm, Technopolis 20 Paphos. Tickets: €12 with all proceeds to the Paphos Music Lovers fund to support local arts projects. 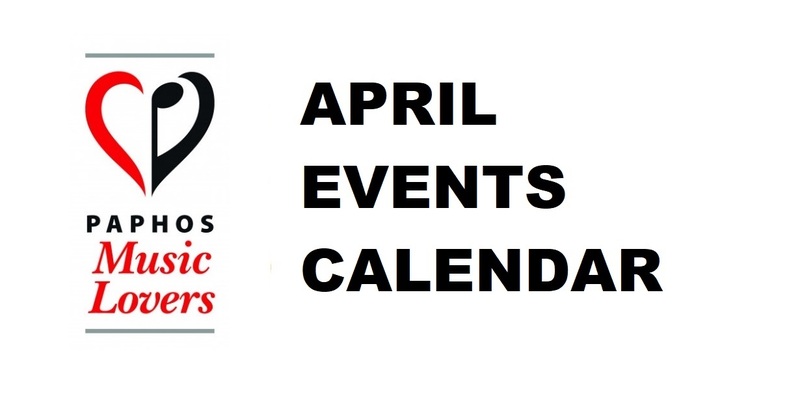 Part of the Spring Music Festival organised by Paphos Music Lovers. Box Office: Tel: 70002420 (calls only). Online Tickets and Information: www.paphosmusiclovers.com. KOSMOPOLITA CONCERT - Music for saxophone, Mimmo Malandra (saxophone) & Borislav Alexandrov (piano), Friday 10 May 8pm, Technopolis 20 Paphos. Tickets: €10. Box Office: Tel: 70002420 (calls only). Information: www.paphosmusiclovers.com. MARVELLOUS MENDELSSOHN - A Tribute to Europe Day, Cyprus Symphony Orchestra, Soloist: Shinyoung Lee (piano), Conductor: Leo McFall, Friday 10 May 8.30pm, Markideion Municipal Theatre Paphos. Tickets: €12, €7 (18-26 yrs, pensioners), €5 (under 18). Box Office: Online at www.cyso.org.cy and 2 hours before the concert. Information: Tel: 22463144, www.cyso.org.cy, www.paphosmusiclovers.com. DIXIELAND AT DARCY’S with Droushia Dixie 7, Saturday 11 May 1pm, Darcy’s Restaurant (outside) Pegeia Paphos. Tickets: €17.50 including BBQ. Box Office: Tel: 99136289 / 26936926. Online Tickets and Information: www.paphosmusiclovers.com. Ticket Outlets: Darcy’s Pegeia, Carmine’s Pegeia, Computer SOS Chlorakas. Sponsored by Blevins Franks. DIALOGUES DES CARMELITES – MET OPERA, Saturday 11 May 7pm, K-Cineplex Kings Avenue Mall Paphos. Tickets: €18 / €14. Box Office: pay on the door. Information: Tel: 77778383. www.kcineplex.com. Information: www.paphosmusiclovers.com. LEADING LADIES, Melanie Ballard, Louise Vreony & Tina Chester, Saturday 11 May 7.30pm, UKCA Club Paphos. Tickets: €19.50 to include fabulous hot and cold buffet. Box Office: Debbie at UKCA or Melanie Tel: 96552901. Information: www.paphosmusiclovers.com. TRIBUTE TO THE LEGENDS OF MUSIC featuring The Moonriver Trio, Sunday 12 May doors: 1pm, Marrakech Restaurant Kissonerga Paphos. Tickets: €25 including hot and cold buffet lunch. Reservations: Tel: 99283566. Information: www.paphosmusiclovers.com. 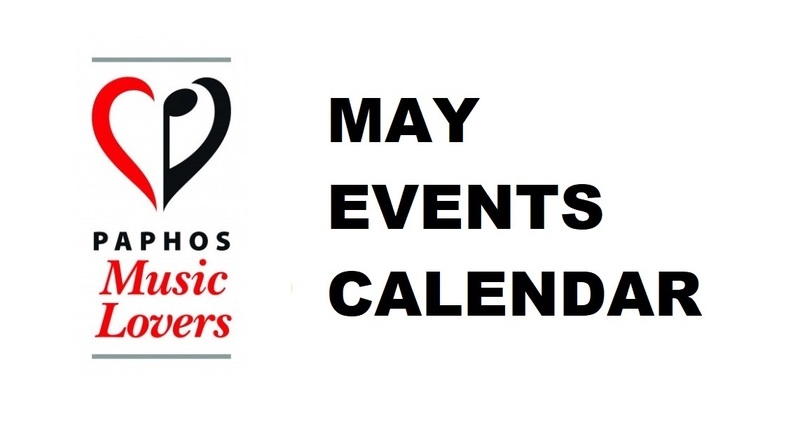 OPEN MEETING with Paphos Music Lovers volunteers and friends - all welcome, Monday 13 May 5pm, Palia ilektriki Restaurant Paphos. Free Entrance. Reservations: Email: info@paphosmusiclovers.com. Information: www.paphosmusiclovers.com. THE CENTRAL BAND OF THE ROYAL AIR FORCE, Wednesday 15 May 6.30pm, Pissouri Amphitheatre. Tickets: adults €15, under 15s €5, infants free. Box Office: Email: abftickets@gmail.com. Tel: 99934668. Information: www.paphosmusiclovers.com. T-REX & THE 70’s SUPERNOVA by Rob Cairns, Thursday 16 May 8pm, Coral Palace Coral Bay (next to Philippos Supermarket). Tickets: €26 including Luxurious 3 course buffet. Ticket Outlets: Britania Kiosk Peyia (next to The Brewery). Online tickets: (no handling fee) www.kendallevents.com. Box Office: Tel: 96818066, Email: karen@kendallevents.com. Information: www.paphosmusiclovers.com. MUSICAL MYSTERIES CONCERT, Anoki Von Arx (sfogato soprano) & Zara Barkhoudarian (piano), Friday 17 May 7.30pm, Eleouthkia Park Paphos. Tickets: €22 including a superb international hot and cold buffet and free drink on arrival. Box Office: Photis Tel: 96099642, Dorothy Tel: 99380182. Information: www.paphosmusiclovers.com. CHAMBER MUSIC CONCERT FOR FLUTE, Ria Georgiadou (flute) & Sven Birch (piano), Friday 17 May 8pm, Technopolis 20 Paphos. Tickets: €10. Box Office: Tel: 70002420 (calls only). Sponsor: Deputy Ministry of Tourism. Information: www.paphosmusiclovers.com. SINCERE PRAISE GOSPEL CHOIR, Saturday 18 May 7pm, Paphos Castle Square. Free entrance. Information: www.paphosmusiclovers.com. T-REX & THE 70’s SUPERNOVA by Rob Cairns, Saturday 18 May 8pm, Vatouthkia Restaurant Koili Tala Paphos. Tickets: €26 including 3 course buffet with tea and coffee. Ticket Outlets: Vatouthkia, Computer SOS Chlorakas, Britania Kiosk Peyia (next to The Brewery). Online tickets: (no handling fee) www.kendallevents.com. Box Office: Tel: 96818066, Email: karen@kendallevents.com. Information: www.paphosmusiclovers.com. THE GOLDEN AGE – Shostakovich – BOLSHOI BALLET, Sunday 19 May 7.30pm, K-Cineplex Kings Avenue Mall Paphos. Tickets: €10 / €8. Box Office: pay on the door. Information: Tel: 77778383. www.kcineplex.com. Information: www.paphosmusiclovers.com. T-REX & THE 70’s SUPERNOVA by Rob Cairns & 70’s Disco, Sapphire Resto Bar TOTK Road Paphos (opp. Aspire School), Sunday 19 May 8pm. Tickets: €15 (food available including a special meal deal platter for 2 for €10). Ticket Outlets: Sapphire Resto Bar. Online tickets: (no handling fee) www.kendallevents.com. Box Office: Tel: 96818066, Email: karen@kendallevents.com. Information: www.paphosmusiclovers.com. AN EVENING OF MUSIC FROM OLD TO NEW, Driftwood Acoustic Duo, Monday 20 May 7.30pm, The Stone Lion Goudi Polis. Tickets: €25 including a delicious set menu. Box Office: Stone Lion Tel: 99038689, Dorothy Tel: 99380182. Information: www.paphosmusiclovers.com. BUTTERFLIES AND THE BIRDS OF PARADISE - Piano Recital, Mari Nakamura (piano), Wednesday 22 May 8pm, Technopolis 20 Paphos. Tickets: €10. Box Office: Tel: 70002420 (calls only). Sponsor: Deputy Ministry of Tourism Information: www.paphosmusiclovers.com. GEORGE MICHAEL & ELTON JOHN TRIBUTE with Johnny Mack & Max Anthony, Thursday 23 May 9pm, Bonamare Beach Bar Timi Beach Paphos. Tickets: €19, food available. Box Office: Kyriakos at Bonamare Beach Bar Tel: 99800298. Information: www.paphosmusiclovers.com. KAMARES FESTIVAL, Saturday 25 May 10am – 4pm, Kamares Village Tala Paphos. Free entrance. Information: Tel: 99387311, Email: mail@in-any-event.biz www.paphosmusiclovers.com. GIRO D’ ITALIA - Journey Through Italy, Anoki Von Arx (soprano), Stelios Georgiou (tenor) and Plotinos Micromatis (piano), Saturday 25 May 8pm, Technopolis 20 Paphos. Tickets: €12. Box Office: Tel: 70002420 (calls only). Information: www.paphosmusiclovers.com. CLARINET RECITAL, George Georgiou (clarinet) and Gergana Georgieva (piano), Sunday 26 May 6pm, Technopolis 20 Paphos. Tickets: €10. Box Office: Tel: 70002420 (calls only). Sponsor: Deputy Ministry of Tourism. Information: www.paphosmusiclovers.com. AN EVENING OF DIVERSITY OPERA & POP, Anoki Von Arx (sfogato soprano), Zara Barkhoudarian (piano) & Gore Melian (voice), Friday 31 May 7.30pm, Anesi Restaurant Pegeia Paphos. Tickets: €25 including a superb international hot and cold buffet. Box Office: Tel: 99313050, Dorothy Tel: 99380182. Information: www.paphosmusiclovers.com.